Issue 18 published on Sunday 8 January 2017 and features a cornucopia of expertise. Edward Timpson MP (Minister of State for Vulnerable Children and Families) and Dr Adam Boddison (CEO of nasen) answer our readers’ questions on the Code of Practice, early identification, nominal budgets, the new national curriculum, the Rochford Review, SEND and teacher training courses, and 2017 and beyond. 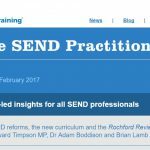 While Brian Lamb OBE looks at the SEND reforms and asks where are we now? There’s a summary of a recent research study that we carried out with hundreds of our Certificate in Psychometric Testing, Assessment and Access Arrangements’ (CPT3A) delegates and a couple of Q&As with two of our most recent CPT3A graduates.